We believe we supply the cheapest fresh rose petals in the UK, if you can find them cheaper, let us know and we will beat them and lower our prices. It's out promise and our goal to be the cheapest and best fresh rose petal supplier in the UK. Our fresh rose petals are offered in quantites from 1-10 jugs. Each jug fills up about 4 pint glasses, so around 2 litres. If you require more than 10 jugs or would like to customize your order in any way please do not hesitate to get in touch. 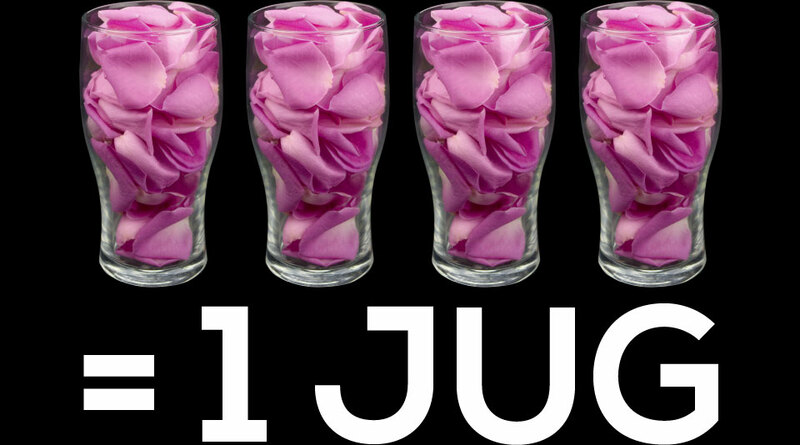 A Jug of Rose Petals - about four pints or 2 litres - Box size 175mm x 90mm x 130mm - Covers 4-5 tables seating 8-10 people - About 12-16 fresh roses depending on the variety and the size of rose used go into making up every jug. If you're wondering what you can do with rose petals, wonder no more... Click Here and see a few of our suggestions.